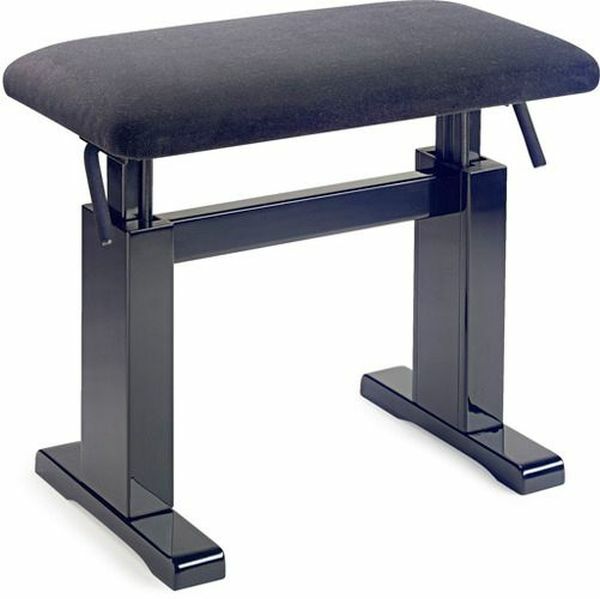 These Adjustable Benches are beautifully constructed of a durable composite and have a cushioned Black Corduroy Seat. Height is adjustable from 18" to 23"
Vinyl Seat size - 13" x 24-3/4"
Our company works with the finest American piano furniture manufacturers in the industry. We sell more than 150 styles of fine quality piano benches & stools in a wide variety of leg styles, wood finishes & fine fabrics, and as the premier seller of piano benches online, our large buying power allows us to offer you the lowest prices for the finest quality! We hope this page will help you to decide which bench is most suitable for you. What is the difference between a Grand Piano Bench and an Upright Piano Bench? A stationery Grand Piano Bench, sometimes called a 'Duet' Bench, is generally between 33" & 36" wide. The width is proportionate to the size of the instrument and certainly adds elegance to any Grand Piano. This size Bench can be used with Grand Pianos, full size Upright pianos, or with any piano where you'd like two people to sit side by side. There is a choice of Wood Top or Upholstered benches and of course our Standard or Duet Artist or Adjustable benches are perfect for Grand pianos. They are wonderful for growing children or for pianists who sit practicing for long periods of time, thus allowing a change of position affording greater comfort. A standard Upright Piano Bench is generally 30" wide x 19" high and is used with all sizes of upright pianos from 36" high to 52" high. Some smaller Spinet pianos look nice with the 25" wide Piano/Keyboard Benches. A Duet bench also looks aesthetically pleasing with larger Full Size Upright pianos (also known as Upright Grands) and are especially good for Teachers who need to sit beside their students. Both 'Adjustable' and 'Artist' Benches can move up or down with the side knobs that changes the height of the seat, however a true 'Artist' bench has a Solid Apron around the bench, so you DO NOT see a space when the top is raised. I saw a bench that looks just like yours on another website, why was their bench cheaper? If the bench is from the same manufacturer as ours, we 'Guarantee' to beat any price... please call us! However, many benches are just Look-a-Likes to ours but are made badly or with inferior materials. Although we cater to every size pocket book, we have maintained our longevity in this business by taking great care to select benches made with only the best Kiln Dried hardwoods (like Maple, Walnut, Mahogany, Oak, Poplar etc), the finest Leathers, Vinyls, Fabrics and Brass hardware, superior construction and effortless adjustable bench mechanisms. Ultimately our benches will last longer. Remember the old saying, "You only get what you pay for". When will I receive my bench? Our benches are always In-Stock and generally ship out from one of our Central USA warehouses within 1 to 2 business days. If a bench does get sold out, we'll let you know right away and let you know when it will be shipped. If you have ordered a custom-made bench (e.g. your own fabric or custom color), or perhaps a special carved leg style, they usually ship out in 7 to 14 business days. (You can't rush quality). We offer Free UPS Ground Shipping on all our benches. 2nd Day Air & Overnight services are available. Is there any assembly required when I get my bench? All benches are shipped in a flat box with the legs wrapped separately for safety. They simply get bolted or screwed into each corner of the bench frame with the 4 nuts and bolts included, and it takes no more than a couple of minutes. Why are some benches more expensive than others? 1) - Our American manufacturers use only the finest woods, leathers and vinyls and the benches are generally hand made, which justifies a higher price. 2) - 'Diamond Tufting' on an Artist bench is more expensive than just a standard button tufted top. Much more fabric is used to make the hand tufted folds, which results in greater comfort and extends the life of the bench. Our American made Jansen, Poeschl and GRK Artist benches have 'Diamond Tufted' tops. At Piano Showcase, our furniture experts have taken great care to select only the finest quality benches from the top manufacturers around the world and each bench is fully guaranteed or your money back. How do I know which Leg Style to select? Our benches come with a large variety of leg styles that can be matched to almost any piano. Many of the older pianos have leg styles that are unavailable today, however we have such a large selection, that one of them is sure to be a close match. When in doubt, we recommend just a plain square tapered leg so it won't clash with the style of your piano. Will the bench color be a close match to my piano? The sample bench colors we show on our website are a close reproduction of our bench stains and in general are a fair match to most pianos. However, it's not exact and should not be used if an exact match is required. Our benches are made of many different types of Hardwoods which have various porosity levels and do not absorb stains equally. There are significant color differences among the various wood species. When stained, this color difference causes intensity variations. The woods contain grain characteristics such as mineral streaks and pin knots that affect the color and intensity of each individual piece. And don't forget, different computer monitors show color hues just a bit differently. The best way to describe the difference between our Walnut & Mahogany colors, is that the Walnut benches are more of a yellowish brown and Mahogany has a touch of red in it. (Brown Mahogany and other colors are available in our Custom Color benches). With over 12,000 different makes of pianos, some new and some very old and faded, if you require an 'exact' match, it's our recommendation that that you purchase one of our 'Unfinished' benches and color match it on site by a technician. Why buy Leather when Vinyl is so much less expensive? The choice is a personal preference and a matter of budget. The Vinyl & Naugahyde fabrics used on all Piano Showcase benches and especially the top quality benches manufactured by Jansen, Poeschl and GRK, are of such superior quality that only an expert could tell the difference. However, be aware that there are many different grades of leather. Sure, you can find 'Bargain Leather Benches' out there, but they're no more than thin synthesized plastic or heavier grade vinyl. Our bench manufacturers use only top quality hides for their benches. Good quality leather breathes, is plyable, and then or course like a new car, there's also that lovely leather smell & touch. To put it into perspective, if you can afford the luxury of one of our Leather benches.... go ahead and treat yourself... You'll be enjoying it long after you've forgotten how much it cost. Do you have a strong bench that will hold a bit of weight. We have 3 selections of School / Teacher's benches that come with extra support rungs on the bottom of the bench for more strength. This style of bench is recommended for heavy traffic use or for people who require a stronger bench. Can I use my own fabric, I'd like the bench to match my decor? Yes, we have several bench selections where you can send us your own fabric and we'll custom make the bench for you. If you require any further assistance in selecting a bench, just give us a call toll-free at 1-800-791-7144. Do you sell American designed Frederick Benches? We do not. Frederick benches are in fact imported from China. Please note: Due to inferior quality and too many customer complaints, we no longer carry Benchworld / Campbell-Young benches. The sample bench colors we show on our website are a close reproduction of the bench stains and in general are a fair match to most pianos. However, it's not exact and should not be used if an exact match is required. Our benches are made of many different types of Hardwoods which have various porosity levels that don't always absorb stains equally. There are significant color differences among the various wood species. When stained, this color difference causes intensity variations. The woods contain grain characteristics such as mineral streaks and pin knots that affect the color and intensity of each individual piece. The best way to describe the difference between our Walnut & Mahogany colors, is that the Walnut benches are more of a warm brown and Mahogany has a touch of red in it. (Brown Mahogany and other colors are available on some of our Custom Made benches). With over 12,000 different makes of pianos, some new and some very old and faded, if you require an 'exact' match, it's our recommendation that that you purchase one of our 'Unfinished' benches and color match it on site by a technician. Piano Showcase puts great effort in displaying colors and products on our website as true to the actual product as possible, however due to image processing limitations and varying computer monitor qualities, colors and products may appear slightly different than the actual item. Color or product assistance or recommendations we offer, either by phone conversation or e-mail message are NOT a guarantee of Color Match or Product Suitability and all Return & Exchange Policy terms and conditions including restocking fees would still apply even if you placed an order with us based on color or product assistance or recommendations we offered. Restocking Fees Will Not be Waived if a Color looks different than pictured on our website. We ask that you be certain of your color choice. If you do elect to order a product from us and do not like that product or its color and would like to return it, all terms and conditions as stated in our Return & Exchange Policy including restocking fees would still apply, regardless if the color you ordered was based on the product pictured on our website or by our assistance or recommendations we offered. However, if you do receive the wrong product or color than the one you ordered, we will happily exchange it at no charge to you. Itâ€™s difficult trying to figure out what one actually wants in an adjustable bench like this. I am very glad I selected this one. I greatly appreciate the hydrolic adjustment system, or rather I should say my wrists do. It is comfortable, sturdy, and I really like that the underside doesnâ€™t have any places where little fingers can get caught. This bench totally fulfilled our need for a comfortable bench for our wonderful but fairly short keyboard operators. It is perfect and answers every need in an Historic 175 year old community chapel. I am very happy with the quality of this bench.